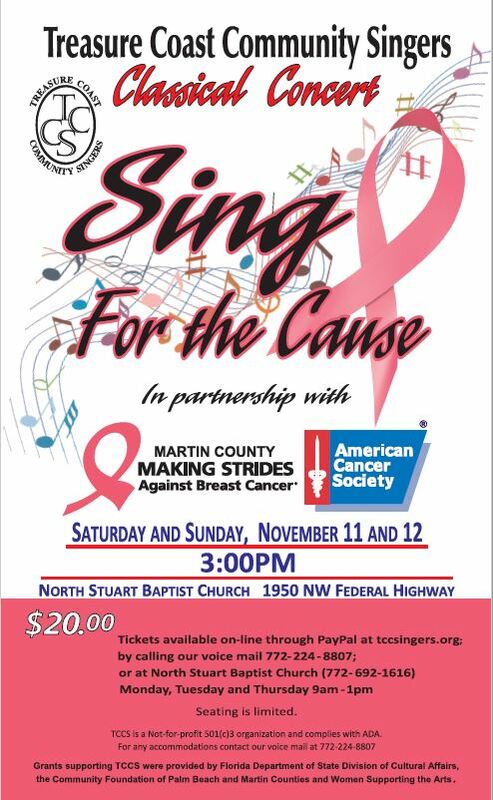 Treasure Coast Community Singers presents ‘Sing for the Cause’ in partnership with the American Cancer Society & Making Strides Against Breast Cancer. Choir, orchestra, & several soloists from Stetson University make this an impressive program. Representatives from the American Cancer Society will be on hand. Come hear this moving (& even funny in spots) concert and support your local community choir and Martin Strides! Sat. Nov 11th at 3 p.m. and Sunday Nov. 12th at 3 p.m.